While the Sensex closed 6 points lower to 36,541 level, the Nifty fell just 4 points to 11,018 level. The Sensex gained 282.48 points on Thursday and closed at a record high of 36,283.25 after crude oil prices posted their biggest one-day drop in two years and robust start of the earnings season. The Sensex retreated from its all-time high of 36,740 to close flat in volatile trade as investors booked profit amid firm global cues. Disappointing macroeconomic data and unabated capital outflows by foreign funds too added to the weak trend, brokers said. While the Sensex closed 6 points lower to 36,541 level, the Nifty fell just 4 points to 11,018 level. The Sensex gained 282.48 points on Thursday and closed at a record high of 36,283.25 after crude oil prices posted their biggest one-day drop in two years and robust start of the earnings season. Reliance Industries (1.34%), Infosys (1.12%) and Bajaj Auto (1.02%) were the top Sensex gainers in trade today. Reliance Industries remained in limelight ending 1.34 per cent higher after company surged past the Rs 7 lakh crore mark, making it the second company after TCS to achieve this milestone. RIL's market capitalisation (m-cap) rose to Rs 7,01,404 crore (over $102 billion). The Infosys stock closed at Rs 1,309.10, up 1.12 per cent on the BSE before the firm's Q1 earnings were announced. Intra-day, it gained 2.83 per cent to Rs 1,331.35. ONGC (2.80%), Axis Bank (2.48%) and ITC (2.29%) were the top losers on the Sensex. Of 30 Sensex stocks, 15 closed in the green. Caution crept as profit-booking was witnessed in most sectors as investors reacted to key macro data release, which came post market hours on Thursday. "The market is grappling with rising core inflation. While the recent drop in crude will help, the likelihood of a rate hike has clearly risen, and that is compressing spreads and margins for financials, particularly those with challenged balance sheets," said Sunil Sharma, Chief Investment Officer at Sanctum Wealth Management. The Consumer Price Index (CPI) inflation rose to a five-month high of 5 per cent in June, while the Index of Industrial Production (IIP) slowed to a seven-month low of 3.2 per cent in May. It was the second week of gains in a row for the markets. 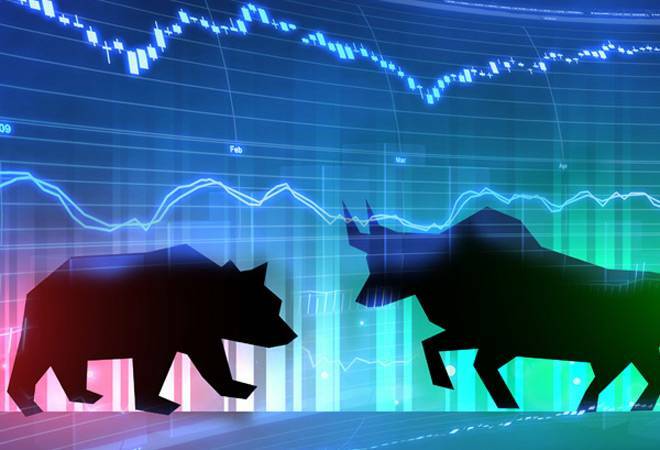 The Sensex recorded a significant rise of 883.77 points, or 2.48 per cent, while the Nifty gained 246.25 points, or 2.29 per cent, in the week. Foreign portfolio investors (FPIs) sold shares worth a net of Rs 742.63 crore, while DIIs bought shares worth a net of Rs 366.40 crore on Thursday, provisional exchange data showed. Market breadth was negative with 812 stocks ending in the green against 1825 closing lower on the BSE. 131 stocks were unchanged. Global shares were mostly higher, rebounding from jitters over the US-China trade disputes for a second straight day. Britain's FTSE 100 advanced 0.6 percent to 7,693.11 and France's CAC 40 rose 0.4 percent to 5,429.49. Germany's DAX gained 0.4 percent to 12,540.36. Futures augured a lukewarm start on Wall Street with S&P futures down 0.1 percent and Dow futures almost unchanged. Asian markets finished mostly higher led by Japan, where the Nikkei 225 jumped 1.9 percent to 22,597.35, helped by a weakening in the yen against the U.S. dollar in a boon to blue chip manufacturers. South Korea's Kospi advanced 1.1 percent to 2,310.90 and Hong Kong's Hang Seng index added 0.2 percent to 28,525.44. But the Shanghai Composite Index fell 0.2 percent to 2,831.18. Australia's S&P-ASX 200 was flat at 6,268.40. Stocks in Singapore, Taiwan and other Southeast Asian markets finished higher.